My daughter, Romy, turned 2 this month. 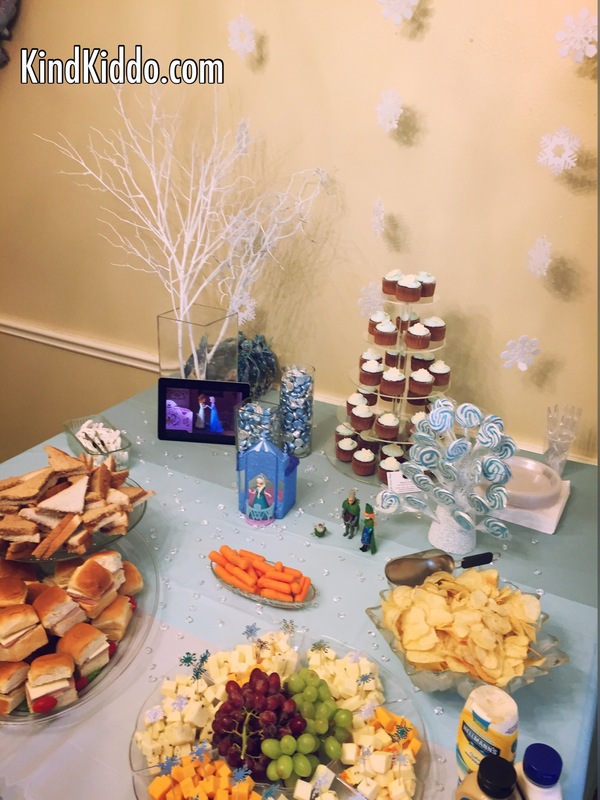 She absolutely loves the movie, Frozen, right now, so I decided to seize the opportunity and throw her a Frozen birthday party. I knew it would be a fairly easy theme to fulfill since it’s so popular. And I needed something easy, because we just moved into our house a couple of months ago, which means that things are still rather hectic around here. 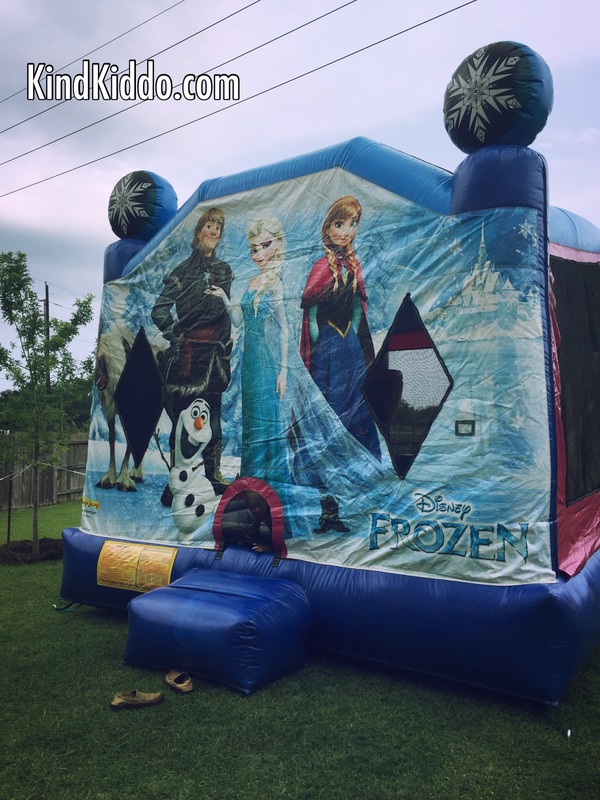 The first thing I did was call the party rental business and secure their Frozen bounce house. A bounce house is seriously the simplest way to provide young children with entertainment if you have enough space for one. I also decided to rent a snocone machine with blue raspberry snocone syrup, because – Frozen, ice, snow, snocones…you get the point. 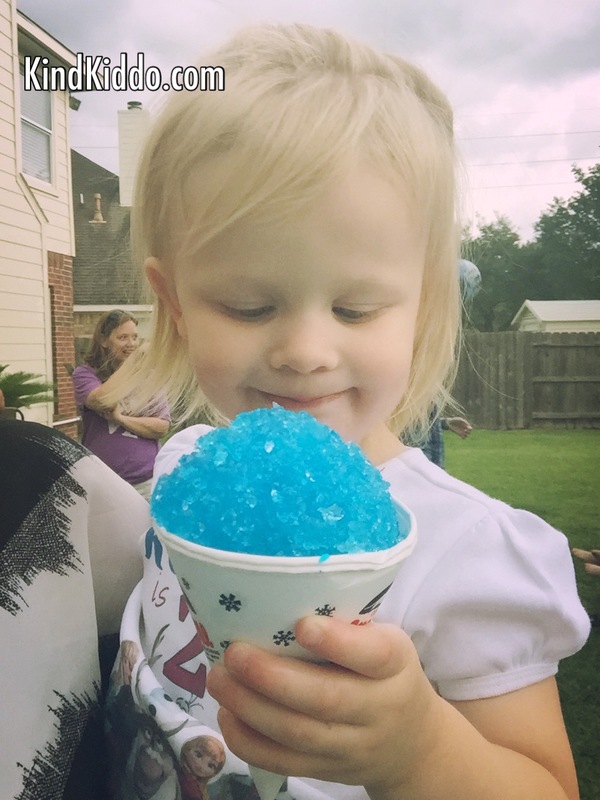 And what kid (or adult) doesn’t love a snocone? My husband and my dad took turns making snocones for the kiddos, and they did a great job. Miss Romy loved them (and tried to bring one onto my new living room rug, but that’s a whole other fun story). As for party decorations, I concentrated 95% of my efforts on the dining room. I hung Frozen decor on the walls (cheap on Amazon), blew up Frozen balloons with a tank of helium I got at the store, and decked out my dining room table. To keep things from getting too difficult, I decided on just one craft project for the party. My husband helped me paint some fake brown branches white and glittery. Then I simply stuck them in a glass vase with a bunch of clear marbles/vase filler. I even added some fake plastic crystals to the vase and also scattered them all over the table. 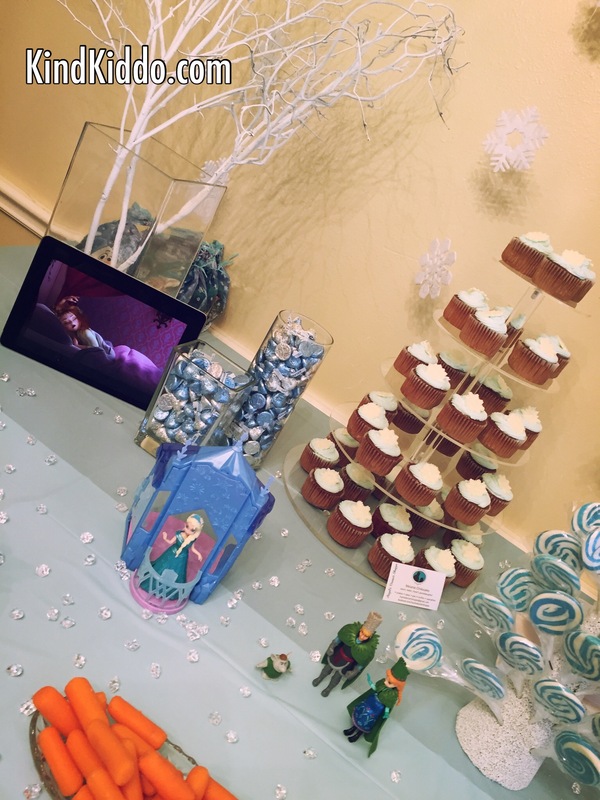 The table also had a couple of small glass vases filled with Hershey’s Kisses in blue and silver wrappers, a lollipop tree (which we painted ourselves because it was originally green), some snowflake garland hanging from the ceiling and a few of Romy’s Frozen toys. And for my final and extra special touch, I put my iPad on the table playing Frozen Fever. If you’ve seen it you know that it’s a short film about Anna’s birthday. So that made it absolutely perfect for our party table. Notice that we had sandwiches (Anna’s fave), carrots (in honor of Sven and Olaf) and chocolate (because Anna and Elsa love chocolate). And the cheese and chips were there simply because Romy likes them. 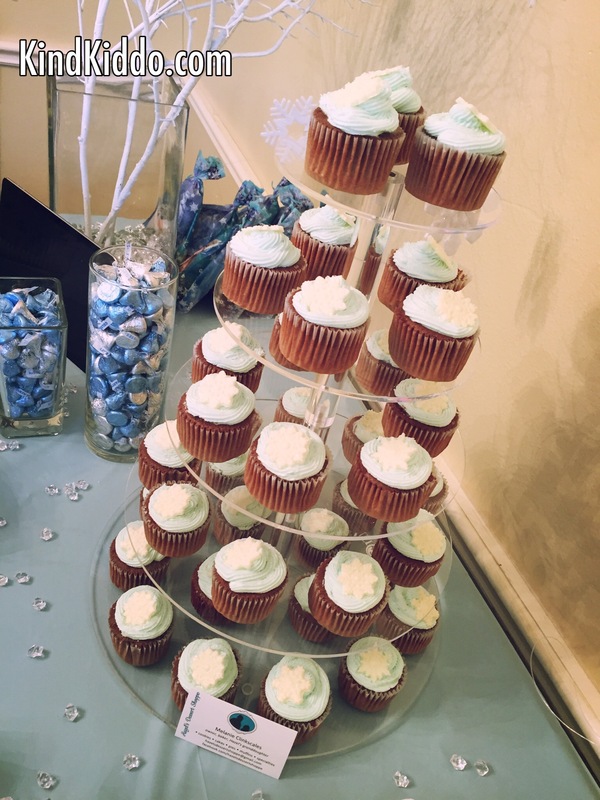 We also had the most delicious chocolate cupcakes with sparkles and snowflakes on top. If you’re in the Houston area look up Hazel’s Dessert Shoppe for all sorts of baked goods. They’re awesome! A rainstorm ended up rolling in about an hour or so into the party, so everyone piled into our house to finish out the night. But even with rain we had such a great time. And the birthday girl was very happy and very TIRED when it was all said and done. Happy Birthday, Romy! There’s no reason to decorate the entire house if you’re trying to make things easier on yourself. Focus on a designated area and take most of your pictures in that area. If you can take advantage of party favors from the store, do it. Handmade favors are wonderful, but if you’re trying to cut yourself some slack, just buy some cool, inexpensive things from the store. The kids will think it’s fun either way. Minimize craft projects. Do just one or two craft projects (or none if you can get away with it) to decorate for the party. If you have to labor long and hard for days and days leading up to the party, it might lead to some unwanted stress. Let someone else do the cooking. I ordered sandwich and cheese trays from the grocery store, bought chips and carrots, and hired a pro to make the cupcakes. After doing everything by hand and homemade for my son’s first birthday 4 years ago, I decided I had paid my dues in that department and never had to do it again. Prep the day before. Get the decor and preparations done the day or two before if possible so that you can work less and celebrate more during the actual party! Next Kind Kiddo Merchandise Coming Soon!!! !